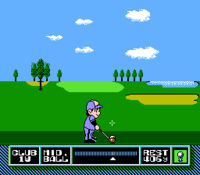 Mark is a character in NES Open Tournament Golf. He only appears in the North American version, sharing this distinction with Steve. He is a young kid who wears a blue baseball uniform, the back of which has a large "1", and a matching blue hat. Mark is also depicted with black hair and blue eyes. He is an amateur ranked golfer who can be challenged in match play. This page was last edited on March 26, 2019, at 17:42.